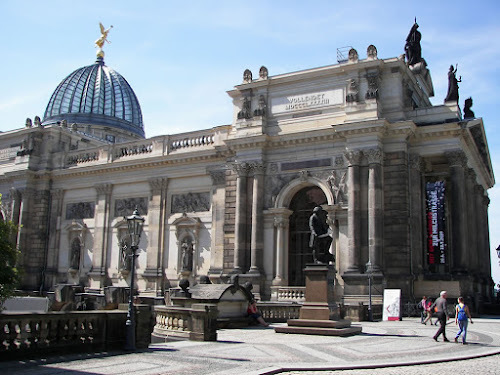 Dresden lies about 200km south of Berlin, and is about three hours away from us using the red RE3 regional train (change at Elsterwerda) and a Schönes Wochenende Ticket. We went today with a group of friends hoping to take some lovely photos between us of this historic city. 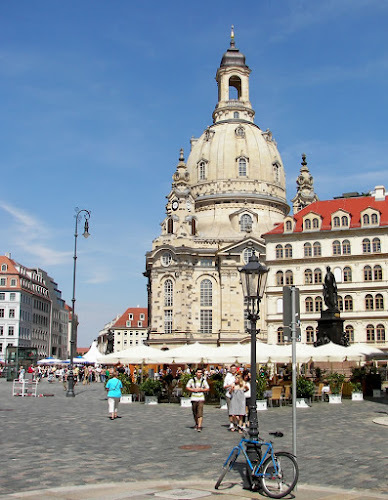 Had we checked on the Internet first we might have picked a quieter date, as Dresden was holding its Stadtfest . Yes, it was busy. Very busy! 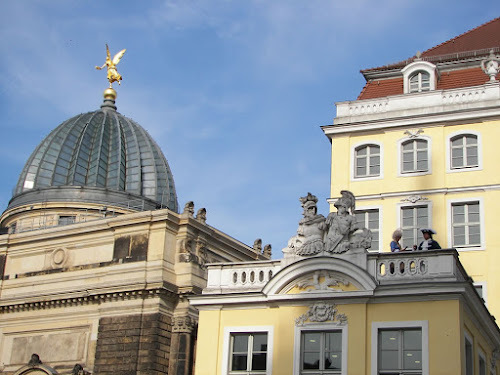 By the way, I'd just like to record my thought that on these excursions with like-minded souls from Berlin, I have met in one year more interesting people from all around the world, than I have in the previous ten years. For example, our group consisted of a Canadian, a Malaysian, two delightful women from Guatemala, and of course us two Brits. 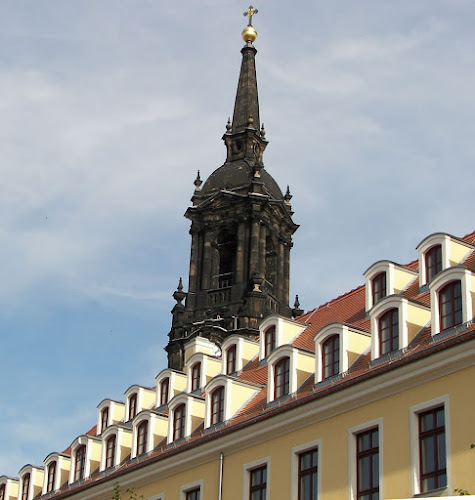 What is amazing about this church is that it lay as a pile of blackened rubble from its near-destruction during the war, through the period of the DDR regime, until reconstruction work began in 1994. 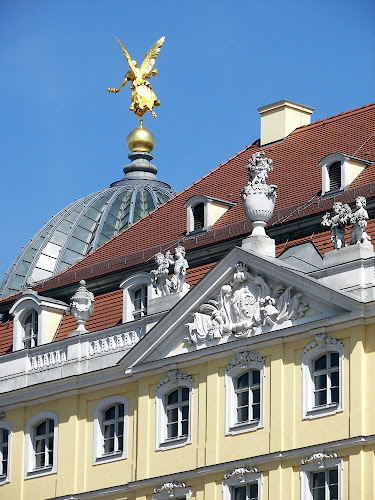 Only in 2005 was its rebuilding completed, and its distinctive dome with gilded cross took its place once more on the Dresden skyline. Poignantly, the 23-foot tall cross was designed by London-based goldsmith Alan Smith, whose father Frank was an aircrew member who took part in the bombing of Dresden in the Second World War. 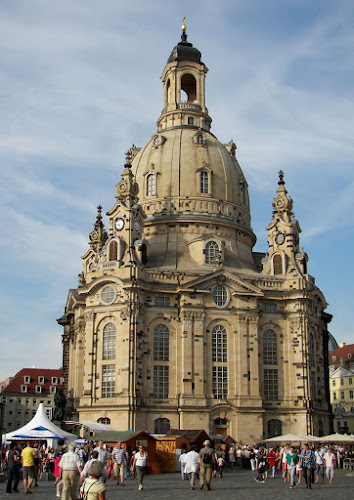 Indeed what is remarkable about Dresden is not that it has so much architectural splendour like the Frauenkirche, than that it has any pre-War buildings at all. This is because of a deeply shameful episode when between 13th and 15th February 1945 it was unmercifully incendiary-bombed by allied air forces to such an intensity that a firestorm destroyed most of the (inhabited) centre of the city. 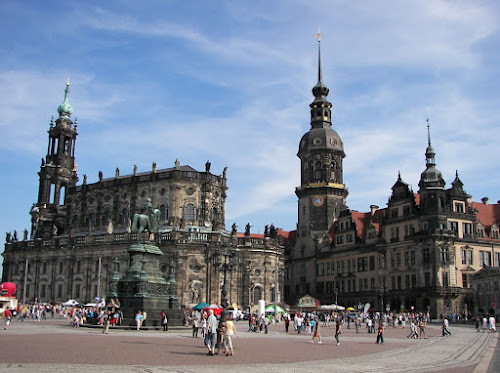 Here are some more of my photos of Dresden (click to make bigger), and whilst you look at them remember that these buildings were all but destroyed in a conflagration raging over a few days and nights in 1945. If only the lives of the civilian families who also burnt horribly to death could be reconstructed too. The Academy of Art (Kunstakadamie) from the side, with not much sunlight reaching it! 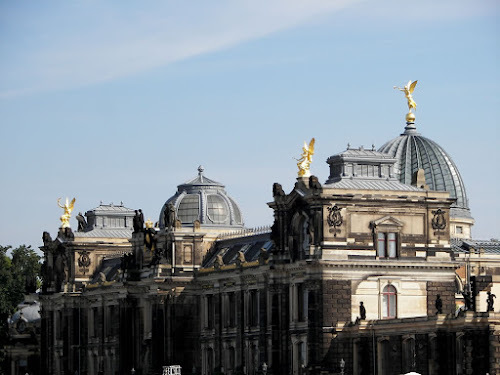 My Beloved thinks that when they built Dresden they should have positioned it on the North bank of the river Elbe. 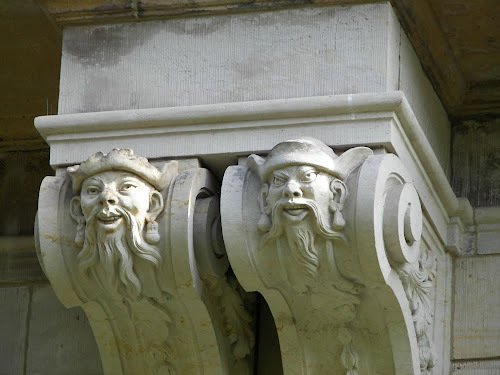 I cannot but agree, but I think the photographers on the reconstruction committee were out-voted by those more concerned about historical accuracy. 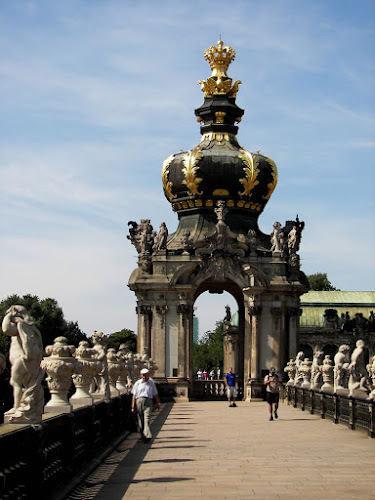 Anyway, it means the grand Brühlschen Terrasse, which stretches along the riverbank from the Kunstakadamie, is North-facing. Ah well. 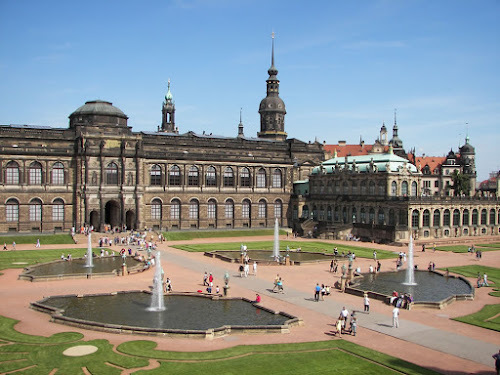 With all this marvelous architecture and history you would think that Dresden might be on the Unesco World Heritage list, or something. 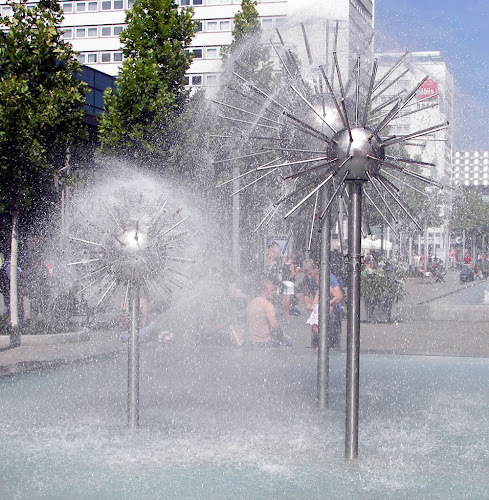 Well it was placed on it in 2006, then taken off it again when the ugly Waldschlösschen Bridge was built. 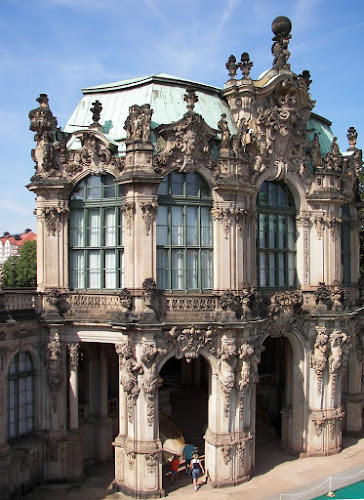 Dresden is only the second ever World Heritage site to be removed from the register. I just hope the bridge was worth it. 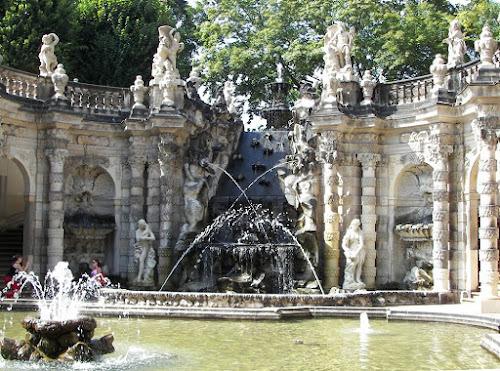 My impression of Dresden is that it reminded me a bit of Bath, in England, except with the neo-Classicism of Bath gone a bit Baroque bonkers. 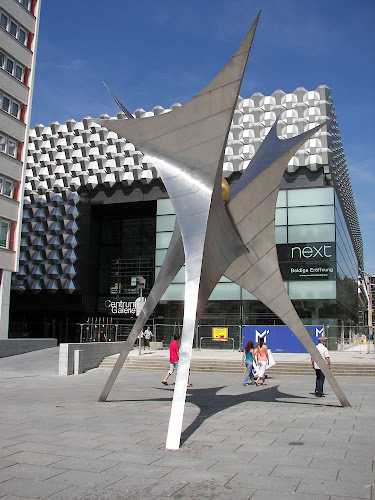 And Dresden's modern shopping precincts are a lot nicer than Bath's Southgate Shopping Centre of course. You get stranger buskers than you do in Bath though! Will we be back? I think yes, but next time we will come on a quieter day! 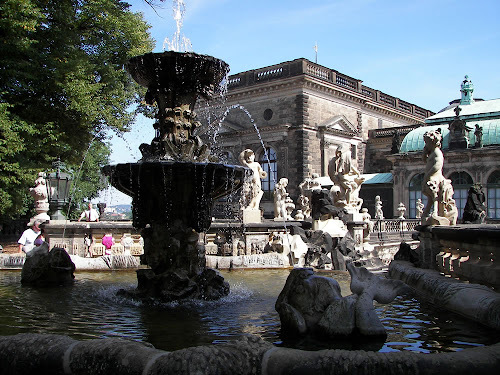 More photos of Dresden at Julie Woodhouse Photography in the Saxony folder. 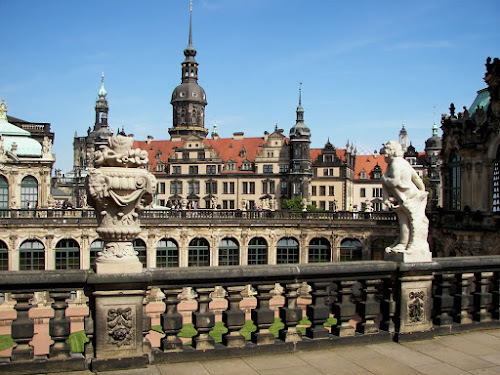 Thanks for the look at Dresden. I have been wanting to visit for some time. Now, I surely will. I spent a couple of days there and really enjoyed it. Couldn't believe the whole place was flattened during WW2- they have done an utterly remarkable job of rebuilding it.